I had this Khara Pongal when I came to Bangalore, I never tasted it before. 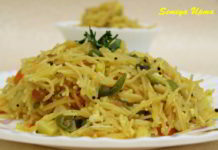 My mother used to prepare Sweet Pongal or can say “Sihi Huggi” (in Kannada) as breakfast with spicy poha. 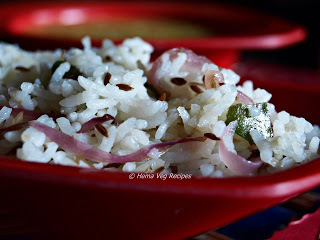 My husband loves this simple, yet tasty Khara Pongal very much. When he visits a restaurant for breakfast he always opts for Khara Pongal. Usually in restaurants they use more Ghee. My mother-in-law always makes Tamarind Chutney when I prepare Khara Pongal. The combination of these two really suits well. 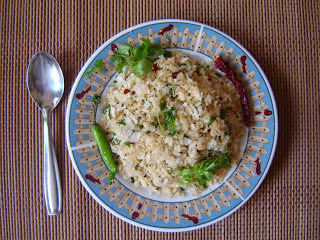 Many people serve this Khara Pongal with Chutney or with Sambar. 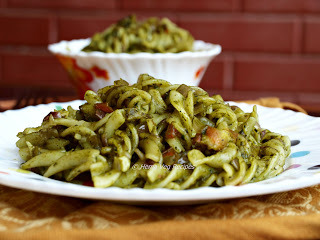 We can have it as breakfast dish or we can consider as lunch. In my house we usually do not prefer to eat any of the rice items as breakfast. Khara Pongal is mainly from Tamil Nadu. They say it as Ven Pongal. In many Venkateshwara Temples they serve this Khara Pongal or Ven Pongal as prasadam in Dhanurmasa season. Dhanurmasa is nearing and after few days of this season, Pongal comes as the New Year’s first festival. 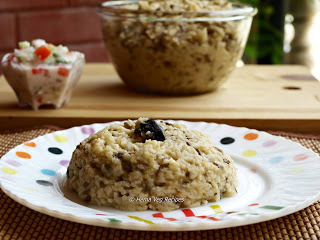 Now you also can try this easy recipe of Khara Pongal and Tamarind Chutney. Dry roast the split Moong Dal for about 5 minutes or till it is slight golden in colour and the raw aroma goes. Mix Rice with roasted Moong Dal and wash it with water. Take a pressure cooker; add the washed Rice and Moong Dal. Pour Water and pressure cook for 3 or 4 whistles till it becomes soft and mushy. Heat Ghee in a pan; add Mustard Seeds, once it splutters, add Jeera and leave it till the colour changes. Now add the Black Pepper and fry for a minute. Then add chopped Ginger, Green Chillies, Curry Leaves, Hing and fry for few seconds. Finally add the Cashew Nuts and fry till it colour changes to golden. Release the pressure of the cooker. Transfer the cooked Rice and Moong Dal mixture to the above seasoned pan and mix it once so that the seasoned ingredients gets evenly distributed with the cooked ingredients. Finally add Salt and mix well. Adjust the consistency, if you feel that the Khara Pongal is too thick, add 1/2 Cup of hot water to it and mix well. Now the Khara Pongal is ready to be served. Soak Tamarind in water for half an hour. Remove the thick pulp from Tamarind by squeezing it and discard the fibre portion. Take a pan, pour a cup of water and Tamarind pulp and mix once. Boil it for 2 to 3 minutes. Now add Rasam Powder, Jaggery and Salt. Mix well and allow it to cook for 6 minutes. It slowly starts to thicken. Switch off the flame. Heat Oil in another small frying pan, add Mustard Seeds, once it splutters add Hing. Immediately switch off the flame. Transfer this seasoning to the Tamarind Chutney and mix well. Tamarind Chutney for Khara Pongal is ready. 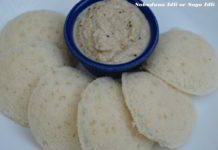 This Tamarind Chutney can also be served with Dosa or Idli for the sweet favourites. The Black Pepper can be slightly crushed and also used in seasoning. In order to get the look of yellow colored Pongal, 1/4 tsp of Turmeric Powder can be added to it. For the crispiness of the seasoning add it at the end and mix well with Dal and Rice.